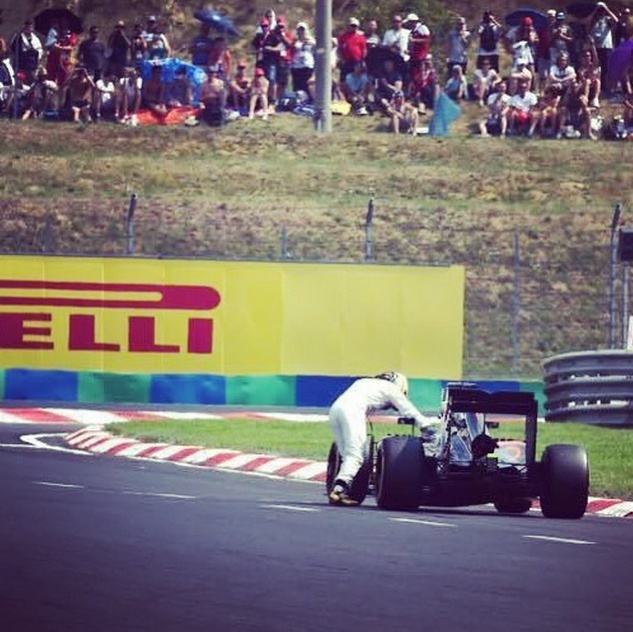 On a scorching day twelve miles outside Budapest where the track temperature hit 129 degrees, Lewis Hamilton topped timing and scoring (1:22:020) in qualifying for the Hungarian Grand Prix at the Hungaroring. He out-paced his factory-Mercedes teammate, Nico Rosberg, by half a second (1:22:595). Former teammates Sebastian Vettel (Ferrari - 1:22:739) and Daniel Riccardo (Red Bull - 1:22:774) round out the second row. The remainder of the top ten: Kimi Raikkonen (P5, Ferrari - 1:23:020), Valtteri Bottas (P6, Williams - 1:23:222), Daniil Kvyat (P7, Red Bull - 1:23:332), Felipe Massa (P8, Williams - 1:23:537), Max Verstappen (P9, Toro Rosso - 1:23:679) and Romain Grosjean (P10, Lotus - 1:24:181). 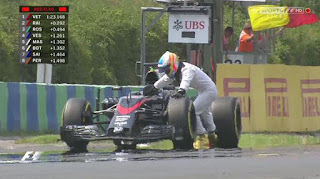 Q2 saw a red flag as Fernando Alonso nursed his broken McLaren Honda to he side of the track at the entrance to pitlane. With the help of track marshals, Alonso pushed his car to the team's garage. Unable to rejoin the qualifying session, Alonso will start 15th, one position in front of his McLaren teammate Jenson Button. "Jenson had a problem with the KERS and for me with the car switched off," said the Spaniard. "Not the right time, but hopefully we learn for tomorrow." With teammates Hamilton and Rosberg locking out the front row yet again, coupled with the notoriously difficult to overtake Hungaroring, Mercedes AMG will likely extend their constructors championship lead, barring any mechanical setbacks.